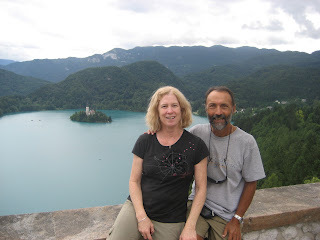 It was about a two hour bus ride to Bled. One can't resist getting the camera out at first sight of the turquoise-colored lake. 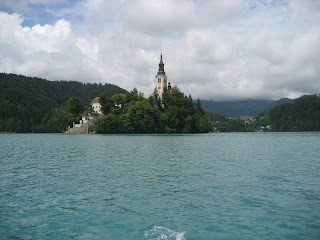 In the middle of the lake there is a small island with a very picturesque church on it and on one side, there is a dramatic view of a castle on a sheer cliff with a church by the lake. It's really a fairy tale setting. After a little search, we found our hotel - the Mayor Pension. 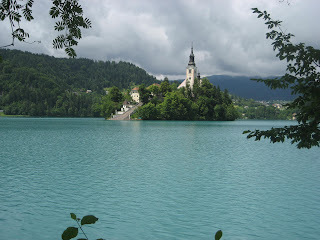 When we got to Bled, fortunately the weather began to clear a bit. The jagged peaks of the Julian Alps (named after Julius Cesaer) became more visible. We spent one day hiking around the lake, renting a row boat and rowing out to the island church in the lake, and hiking up to the castle that dates back a thousand years. The next day we took a bus to Bohinj and its lake. We then hiked to Savica waterfall, a splendid sight (the name for waterfall here is "slap"). It's a dramatic sight because the water rushes out of the middle part of the sheer granite cliff falling several hundred feet. On the way back, I noticed some interesting sail boats that looked like miniture versions of 12 meter racing boats. There looked about two meters. At night after dinner at a more upscale "gostilna", we stopped at a vinoteka where were able to taste Slovenian wines. We met the owner and some really nice Slovenian wine affecianados and ended up spending far more time there than we had anticipated. It didn't make it easier to get up the following day when we were taking the bus to the eastern part of Slovenia. 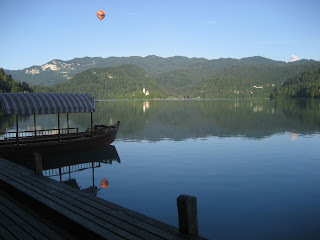 With its fairy tale setting, Bled appears to be a popular spot for weddings. During our short stay, there was one wedding at the island church and another one at the casle. I believe both involved Americans. Some comments about Slovenia - we find it to be a very clean country, with not much litter (not even cigarette butts in spite of a number of smokers). We drink the tap water right out the tap everywhere. It tastes great. Public transportation is efficiently run, well organized and not expensive. Slovenian people are very friendly and helpful. Most speak reasonably good English (thank goodness, because their language doesn't come easy to us). We are lucky in that there are not that many tourists here. From what we've been told, that's partly due to the cold and cloudy weather and due to the economy around the world. Of the wines we have tasted the white wines fare better then the reds. The only reds we have liked are from the western region near the Italian border. We have now arrived in the eastern part of Slovenia, known for its excellent white wines. We are staying in the city of Maribore, will rent a car and tour some of the wineries. Ciao.